In the mid 70’s skateboarding changed from flat to vert and was characterized by its heavy aggressiveness. But it was not always like this, even if the sport was dominantly male oriented, many girls, and even some guys, integrated gymnastic-type moves into their skating; it was all about grace, flow and style. 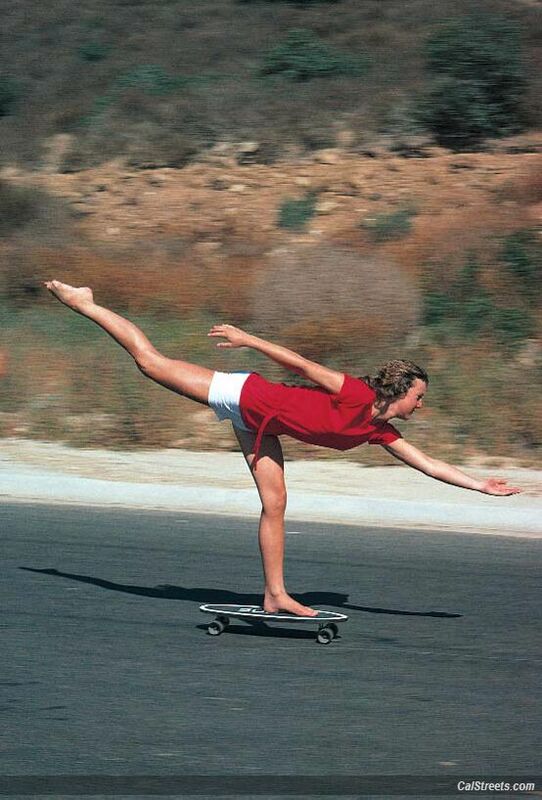 At the time when skateboarding was rapidly changing, girls were not only flying down the hills, they were doing it tiptoed and with one leg (or both) in the air. Sure, some girls skated aggressively (Peggy Oki for example) but most of them, like superstars Ellen O'Neal and Ellen Berryman, had a definite feminine, balletic style that was appreciated by the guys as much as the girls. In the early and mid-seventies, before the infamous Z-Boys assaulted the BAHNE-Cadillac Nationals in April of 1975 at the Del Mar Fairgrounds, skateboarding was upstand and was mimicking old surfing moves from the 60’s. Only a few girls were portrayed in SkateBoarder Mag: Peggy Oki, Ellen O'Neal, and Ellen Berryman were those to achieve that fame. Ellen Berryman was quiet yet powerful. She skated with fluid, grace and controlled style. This grace and style was stemming from one of her activity prior to skateboarding: she had developed an interest in gymnastics which sprang from a desire to learn the basics of balance and movement however, he interest slowly waned. She broke free from gymnastics because she reached a point where learning, creativity and fun were being hampered by the demands of the team and the rigid structure of the sport. Then, Skateboarding filled the void, especially freestyle with its unstructured rules. She quickly found that applying her knowledge of balance and motion brought a new flavor into skateboarding. The opportunity came when she was asked to join Team Bahne where she was one of the pros. Around 1972, Bill and Bob Bahne started manufacturing skateboards in Encinitas, California. They produced hundreds of thousands of skateboards during the 70’s. Mostly known for their flexible, fiberglass boards equipped with Chicago trucks and Cadillac Wheels, the Bahne brothers constantly strived to improve the construction and performance of their boards, wheels and trucks. In 75, the company reported sales of 10,000–20,000 skateboards per month. Nasworthy's association with Bahne led him to commission a series of paintings by poster artist Jim Evans that featured Cadillac Wheels. The posters, with titles like, "From Out Of The West" and "Accept No Substitutes" (later reused by Independent trucks in the 80’s) came to represent the paradigm shift taking place in skateboarding. Ellen Berryman was crowned World Champion at the California Free Former World Professional Skateboard Championships held at the Long Beach Arena in California. If you want to meet Ellen Berryman, she will be the official "honoree" of the Mighty Mamas skate-o-rama on May 7th at Laguna Niguel Skatepark. According to the organizers of the event, she might even “recreate some of her cool moves”! Way to go! 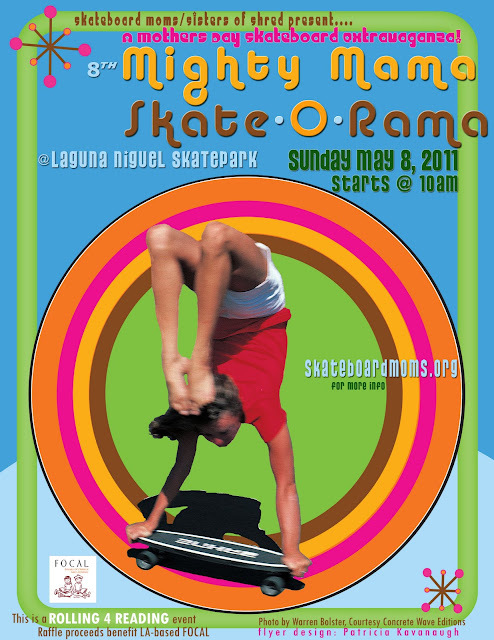 The groovy event poster was designed by Patricia Kavanaugh featuring a photo of Ellen by Warren Bolster, courtesy Concrete Wave Editions.